Your CT Scan - Onestopmesothelioma!! CT scans A computerised tomography (CT) scanner uses X-rays to produce cross-sectional images of the body. When the image slices are reassembled by computer, the result is a very detailed, 3D view of the body's interior. CT scans are investigations that can be used to help to make a cancer diagnosis or assess the effects of cancer treatment. Your doctor will recommend a CT scan based on the type of cancer you have and the information needed to plan your treatment. 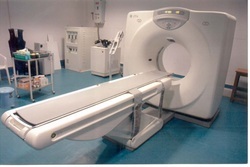 CT scanners use X-rays at the lowest practical radiation dose. The benefits of having a CT scan and the information obtained from the scan compared to the risk of exposure to radiation will be weighed up by your doctor before deciding to send you for the scan. If you have any queries about this, please speak to your doctor. CT scans are not suitable for pregnant women. Preparing for a CT scan Usually, you will be asked to not eat for two hours before your appointment time and to drink 500ml of water (tea or coffee is fine) during this time. The water hydrates you prior to having contrast media for the CT. In the waiting area you will be asked to drink another 500ml of water which outlines the stomach and bowel clearly on the scans. The water also helps fill your bladder so that it shows on the scan. For most scans, you will be able to wear your own clothes as long as they have no metal in them. You may be asked to remove belts or jewellery as metal can interfere with the scan and cause streaking on the images. Hospital gowns are available as required. Most CT scans require you to have intravenous contrast medium (dye) which is given via a cannula which we place in your arm or hand prior to the scan. CT scans are not usually long examinations – the scan itself takes about 15 minutes but the preparation (drinking water and being cannulated) takes time as well. You may require a blood test before we can give you contrast medium. The CT scanner The scanner looks like a large doughnut. You will be asked to lie on a cushioned table which will move slowly through the scanner to allow pictures to be taken at different angles. The machine makes a noise while working. During a CT scan During the scan an injection of contrast medium is often given; this dye contains iodine. It is not radioactive and it shows up as white areas on the scans, helping the radiologist to tell the difference between blood vessels and other structures. You will be asked about allergies and your tablets to assess your suitability to have the injection and minimise interactions with other medicines. For some scans you may be asked to hold your breath or to stop swallowing for short periods. Most of the time you will be able to see out of the scanner, so this type of scan is not usually a problem for people who feel claustrophobic. However, if you are worried about this please speak to your radiographer before you come in for your scan. After a CT scan As soon as the scan is completed you can go to the toilet, and eat and drink normally. We recommend that you wait an hour after your injection to make sure that you are feeling well before you leave the hospital. It is safe for you to drive home after the hour has passed. When you get home you should drink 500ml of liquid (tea or coffee is fine) to rehydrate your body after the contrast medium. There are no side effects to having a CT scan. However, people do very occasionally have an allergic reaction to the injection of contrast medium. Staff are trained to manage this situation if it arises. The scans will be carefully analysed and interpreted by a radiologist, who will prepare a report and send it to your doctor. Your doctor will discuss the results with you at your next outpatient appointment. Radiology team CT scans are performed by members of the Department of Diagnostic Radiology.